The following are some highlights from the field covering a numbers of sites that I birded over the past few weeks in March. This Peregrine Falcon put on quite a show (looks like a male), while taking a bath in a freshwater puddle. Although not a year bird, this Piping Plover was my earliest PIPL migrant in Queens on March 12th. 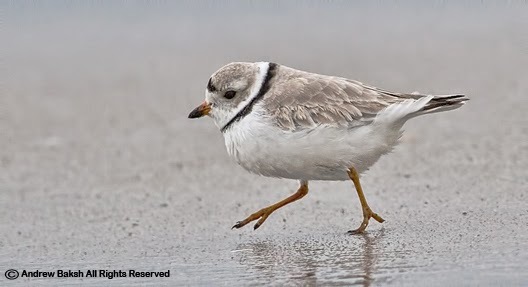 For the curious, my year PIPL was in January when I saw an overwintering bird at Point Lookout, Long Island NY, with Doug Futuyma and later with Tom Burke and Gail Benson. Female ducks don’t often get the recognition they deserve and I recommend spending some time studying them in the field as often times birders get tripped up when confronted with a difficult ID due to unfamiliarity or poor looks. This female Northern Pintail was quite the delight to see at Oakland Lake in Queens NY. And right after I mention giving the females their due, I am suckered right back into focusing on a drake, but I have an excuse. How could I not with this handsome Wood Duck (right) who was guarding his female companion (not pictured) from the aggressive overtures from 3 other drake Wood Ducks. Those lads were serious about making a move on his girl, but he was having none of it. Not many reported as yet locally, but I was lucky to pick up my first of the year, Blue-winged Teals, this past weekend. A pair and I managed to pick them out despite their low presence on the water and hiding amongst a group of Mallards. With all the Red-necked Grebes being reported, I found two this past weekend while exploring new sites to bird. They showed more breeding plumage than any of the other Red-necked Grebes that I have seen at other location this year. Here is one for your viewing pleasure. 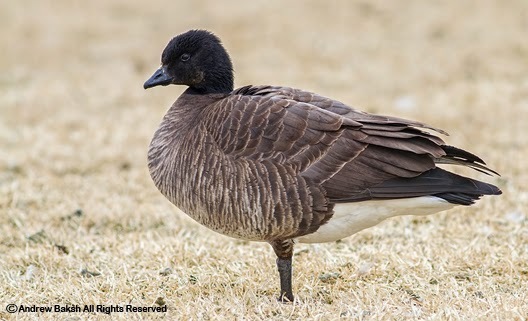 The breast is concolorous with the flanks and decidedly browner than the black neck--just as in Cackling and Canada geese, but differing markedly from Brant's (and Barnacle Goose's) extensive, black neck stocking. The characteristic white neck markings of Brant are absent. 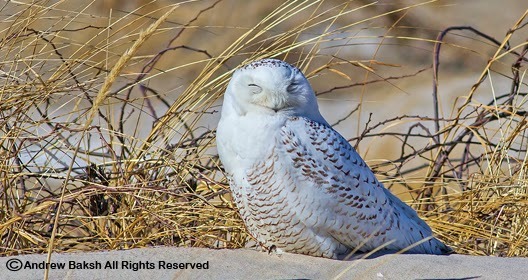 There is a hint of whitish cheeks, on both sides of the face, as in Cackling and Canada geese. 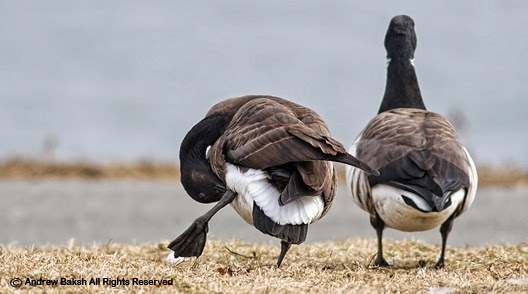 The tail is extensively black beyond the coverts, as in the white-cheeked geese, but unlike Brant. 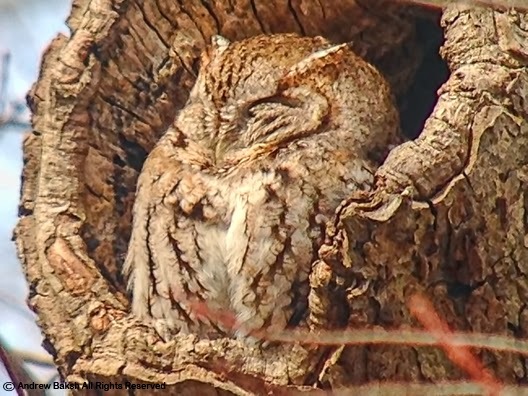 Here you could see the extensive black beyond the coverts (see # 4 above for more details). Shai, further suggested that even if the identification was correct, both proposed parental species were polytypic, so questions surrounding which taxa were involved are unanswered. He proposed that hrota x hutchinsii would seem the best bet, purely on geographical grounds, but then brings our attention to the bird’s ventral plumage, which is much darker than in either of the forms mentions. He also uses the structure of the bird suggesting that the petite and small billed look was perhaps too much for one of the parents to be hutchinsii. However, if the bird originated farther west, then perhaps nigrans x minima could plausibly produce such a hybrid of this appearance. 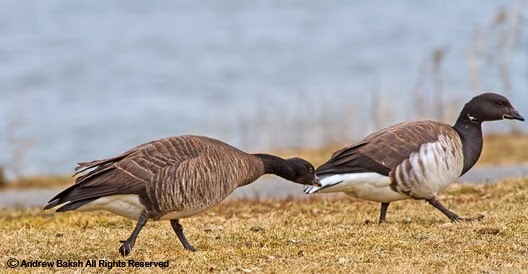 He rounds out the possibilities for Brant parentage by referencing, “Gray-bellied Brant,” which breeds in the western Canadian high arctic, and which has possibly occurred on Long Island as a vagrant, suggesting it ought to be considered, as should bernicla, which has been reported several times on the East Coast, including long Island. This was an excellent analysis from Shai, but before deciding if you agree, you should read this equally top notch analysis from Angus Wilson, when he first documented this bird in 2003. 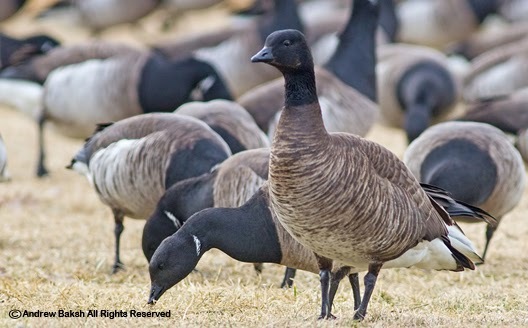 Angus, presents the theory of a Brant x Canada with solid reasons. You should also take a look at the comments area where birders from around the world offered their opinion. In my last blog post, I promised readers additional images of the Common Teal that I found on March 1st in Brookville Park Queens, NY. In this post, I present photos of both American Green-winged and Common or Green-winged Teal (Eurasian) for comparison and walk through some of the field marks. 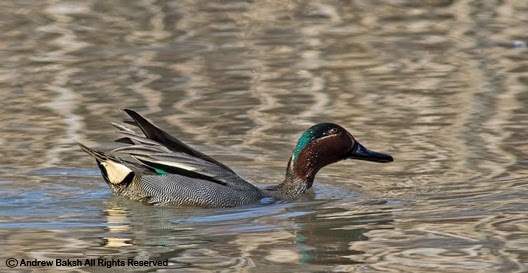 While Green-winged Teal is considered a single species by the AOU (American Ornithologists' Union), 2 of its subspecies are very distinctive in adult plumage and are recognized as two separate species by many authorized ornithology bodies. 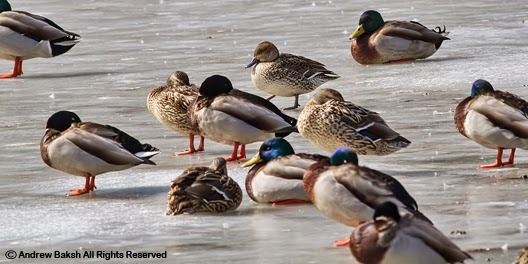 Hence, we have American Green Winged Teal (Anas crecca carolinensis) and Eurasian Green-winged Teal or Common Teal (Anas crecca crecca). 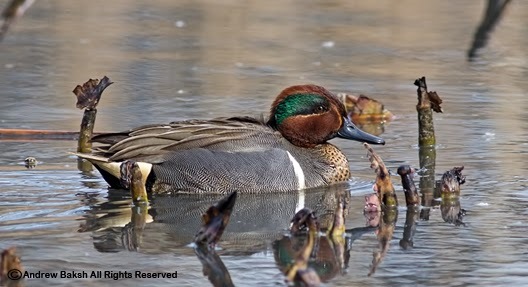 The Common Teal is a rare visitor to North America, with records showing that the best chances of seeing one is in late winter early spring. It is important to note the time of the records; chances are Common Teal in non breeding plumage are overlooked or just unidentifiable in the field (now there is a nice challenge). American Green-winged Teal. Note: The vertical stripe. This is not the first one that I have seen or found in Queens, NYC, but it is the first that I got very close up looks of, which I took advantage in getting in some good field study time. One of the first field marks that stood out when I spotted this duck as it made its way out of Phragmites was how well marked the facial pattern appeared to be and how paler the breast was in comparison to a nearby American Green-winged Teal. At that time, I was not sure it was a Common Teal. However, once the duck turned slightly in side profile and I saw the white horizontal stripe in the lower scapulars and no sign of a vertical stripe. I began thinking, it was possible that I had found a Common Teal. Common or Green-wing Teal (Eurasian) Note: the prominent facial marks and lighter breast. I carefully studied the bird to ensure there was not a trace of anything like a vertical stripe, which would mean it was more of an intergrade (American X Common Teal) instead of a pure Common Teal. After studying the bird for a bit, I was convinced it was a pure Common Teal and so put out a post to the list serves before trying to obtain additional documentation in the form of field notes and photos. Coincidentally, following this bird, I saw an intergrade American X Common Teal last Sunday at Saggaponak Pond on Long Island with friends Tom Burke, Gail Benson, Douglas Futuyma, and others but it was too far out for even a digiscope attempt. That would have been nice to include here for comparison as well. Common or Green-winged Teal (Eurasian) with a nice side profile showing the horizontal stripe. 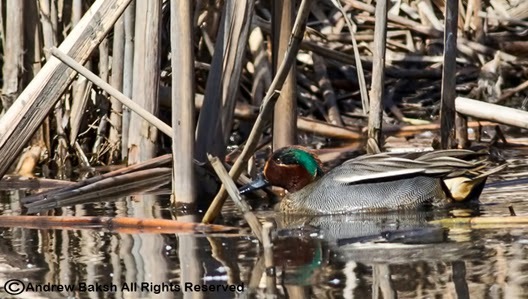 Common or Green-winged Teal (Eurasian). Note: the nicely marked facial pattern. Some images to share with readers from a a few outings in the field. 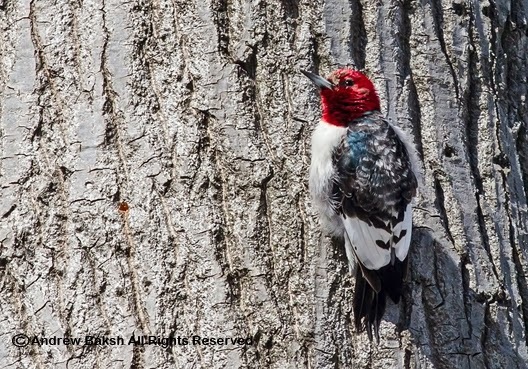 This Red-headed Woodpecker continues in Kissena Park Queens at least as of February 24th when I last saw it. I think this could be the immature bird that was seen back in October of 2013 that has matured nicely. 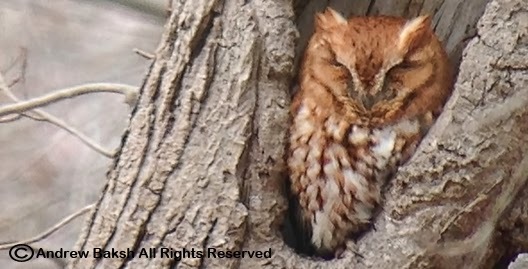 Note the forehead still shows some brown feathers from the immature plumage. 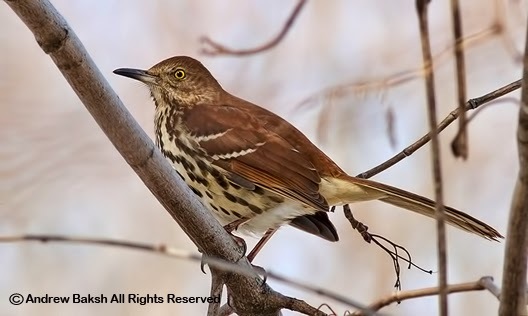 This Brown Thrasher, was also observed and photographed at Kissena Park. I find this bird to be very difficult to get out in the open, so I was very grateful to get this semi decent photo. I should add; this is one of my favorite birds. 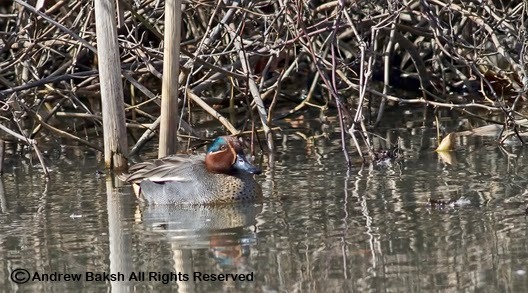 Last Sunday, I found a Common Teal or Eurasian Green-winged Teal at Brookville Park in Rosedale Queens. At some point, I will do a separate post with additional images, but here is one showing the horizontal stripe on the lower scapulars, which is a key field mark for Common Teal.